Thanks for sharing your list! This sounds like a fun event! Tarantulas and Emily Dickinson? I have got to see this! I too won't be participating every day but am so happy to see the event come back. Oh you brought back reading memories when you mentioned Mists of Avalon. Beth F - It's good to BBAW making a comeback. :-) I wonder if I would feel the same about it today as I did when I first read it . . . It's one of those books I'm afraid to read again to find out. Isn't that awful? What a great list of books! I have never heard of Tarantulas On The Brain, but I'll check it out. I have meant to read The Mists of Avalon for a long time. I have a copy of The Way The Crow Flies on the shelf behind me (so you suggest I read it?). I have Behind Closed Doors on my Kindle and the Lawson book is an upcoming selection for one of my book groups. Whew! Wendy, your blog is one of my favorites and you do a marvelous job of sharing your life with us. I love stopping by! Kay - Thank you! I hope you will like Tarantulas on the Brain if you do read it. It's a fun one. I do recommend The Way the Crow Flies. It's long and on the sad side, but so worth it. I think anyway. :-) You can't go wrong with Elizabeth Haynes. I'll be curious to know what you think of Lawson's book. It's a bit out there, but I really enjoyed it. You are so sweet to say such nice things. Your blog is one of my favorites too, and I am so glad you are back to blogging. Mists of Avalon! What an epic book. Such a great choice. Such a great list! Heather - It made such a big impression on me. It's nice to see it had a similar effect on others as well. Jenny - I was too. I didn't want to believe it at first, but the more I researched it, the less doubts I had about it being true. So sad. I read a number of teh Sword and Sorceress collections too--I'd nearly forgotten about them. I loved them too. Thank you for the Tor.com link! I hadn't seen that, but I'm off to check it out. I was very involved with the Valdemar books for year and years. I always wanted my own Companion. Oh man, spiders. Not for me but good for you! I'm not participating everyday either but am so glad BBAW is back. I've never heard of Tarantulas on the Brain but now I'm curious about it. I don't believe I've read any of these books, but I'm interested in the last book - crime fiction is a favourite genre of mine, although I don't make enough time to read it lately. Jade - I hope you will give Behind Closed Doors a try. Elizabeth Haynes is one of my favorite crime fiction authors. I love your write up. 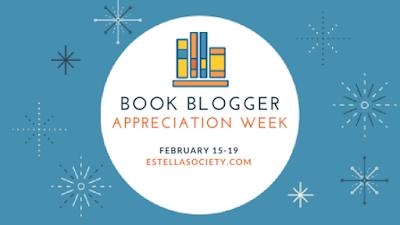 Thrillers are my favourite genre so I'm excited you included Behind Closed Doors which is actually on my Feb or March TBR list. Marce - Thank you! I hope you like Behind Closed Doors! It's dark, but oh so good! Hi hi hi! I'm new here but I just wanted to say hello and that I'm soooo glad to see Ann-Marie MacDonald on your list! I haven't yet read The Way The Crow Flies, but Fall On Your Knees broke me into thousands of tiny pieces... In a good way. Also high five for The Bloggess. She's the best. What a great introduction! I have always wanted to read The Mists of Avalon but I have not heard the negative stuff about the author. Maybe it's better if I don't know! Shelley - Yes, don't look into her past. It's best not to know if you are the kind of person who has trouble separating the author from his or her art. Tarantulas were too scary for me to even pick up that book! Great list! Thanks for sharing this list. It's nice to know you even more. I read The Way The Crow Flies a couple of years ago and enjoyed it and went on to read another book by this author. I'm considering telling my daughter about the Tarantula book for her kids but not sure if the reading level jives with them (girl- second grade, boy- third grade, girl- seventh grade). Any opinions? I have always wanted to read The Mists of Avalon. Not sure what the author did to make you cringe but I'm going to look it up. Also nice of you to offer a substitute one, by Lackey. I love crime fiction too, my fave genre and read the first book by this author, In a Dark Corner, but found that one rather disturbing to read, just me. Rita - I cried quite a bit at the end of The Way the Crow Flies. I haven't read MacDonald's other book, Fall on Your Knees, although I have a copy in my TBR pile. One of these days I'm just going to have to pick it up and read it. 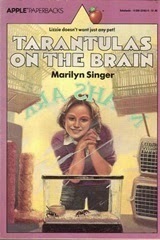 I think I read Tarantulas on the Brain in 5th or 6th grade, if that helps. It might be one your younger grandchildren like in another year or two. The seventh grader might like it now--or she might think she's too old for it, depending on where her reading tastes are now. Elizabeth Haynes's novels do tend to be disturbing. Behind Closed Doors is, especially given the subject matter. I really liked Into the Darkest Corner. I think it's still my favorite of hers, although I've enjoyed all her books. Thank you for stopping by, Rita! Kelly - I loved Matilda too. :-) I never got into the Babysitter's Club series, although I know they were quite popular. I was more a Girls at Canby Hall girl myself. You reminded me to put The Way the Crow Flies back on my to-read list. I remember a friend telling me about it years ago, long before blogging TBR lists overtook recommendations from friends! Priscilla - I have that list too. So many books friends have recommended and yet I haven't yet gotten to them because of other books that seem to get in the way. Someday. Mists of Avalon is one of my favourite books ever. I really must reread it one of these days! Kelly - I'm kind of afraid to reread it. It might be best left in my memory. This must have been very difficult! I know I would struggle with it. Thanks for sharing. I didn't know that about Bradley, I had to google it after your comment. That would make it hard for me as well to enjoy her work, or anyone else's in similar circumstances. What a shame. Nicole - It was hard to figure out what direction to go with the topic and then to settle on the books. I could probably tweak it forever though, and never feel completely satisfied. :-) Yes, it's so sad about Bradley. More so for the victims. Mmmmmm, ice cream and chocolate. And popcorn for me. It was hard to think of books that sum as up as people! I will have to look up what's this all about Marion Zimmer Bradley! Mists of Avalon is a book my now-husband-of-30-years gave me back when we were in high school and it was so far off from my reading tastes that I don't think I gave it a chance. I was a book snob until I went to library school! Laurie C - Popcorn is another weakness for me too, admittedly. I am generally not a fan of Arthurian stories, but Mists of Avalon really appealed to me. I think perhaps because the focus wasn't completely on Arthur. "Let's Pretend This Never Happened" and "The Mists of Avalon" affected me a great deal, also. 'Avalon' led me down a path of looking for feminine spirituality. I was horrified when I learned- only about a year ago- what an awful person MZB was. I do not think I can ever re-read it, knowing who was behind the curtain. The Bloggess's book made quit an impact on me- I'd been reading her blog before I read the book, so I had already read parts of it but not all. Reading her book was one of those "OMG there is someone out there like me!" moments. Laurie B - I had that same reaction when reading Lawson's book. Her stories have touched so many people. Bradley's past is one of the reasons I hesitate to pick up Mists of Avalon again. I just can't bring myself to do it. I don't want my initial impression of the novel to be tainted any further. I had no idea about MZB - I had never read her books so had not heard of this news. How horrible. I may have still attempted The Mists of Avalon previously but after having my own kid, reading about child abuse is hard enough, reading a book by an author guilty of it is harder. I need to read the Jenny Lawson book - it has been highly recommended. Athira - It's sad too because it really is a great book. I hope you enjoy Let's Pretend This Never Happened. I have the audio of her second book, but haven't had a chance to listen to it yet. Such wonderful choices. I pulled several muscles from laughing at Lawson's memoir, and I'm past due an Ann-Marie MacDonald reread. Her books always hit me hard. I tried to read THE MISTS OF AVALON when I was thirteen or so and bounced off it, but I always felt like it was a book that'd mean a lot to me once I went back to it. Then I learned about her actions and realized that'd never be possible. I am glad I got to experience Mists of Avalon before I knew, as I wouldn't have been able to read it after I found out. Thanks for sharing and that's a great last you've got, Wendy! I've only read Behind Closed Doors so I need to check out the others. Mists of Avalon is one that I've been meaning to read for years! Also The Way the Crow Flies--I LOVED Fall On Your Knees but I think it's the length that puts me off a bit. Need to just pick it up and dig in. Great list! I was also considering The Mists of Avalon, as it's one of my all time favorites, and for exactly the reasons you mentioned. I loved the Arthurian legend told from a woman's perspective. I read it when I was in my late 20s. I plan to read it again someday. Michelle - I have never been a huge Arthurian legend fan, but Mists of Avalon appealed to me for that very reason--for the female perspective. It's such a good book. Thanks for visiting! I haven't read The Mists of Avalon for ages, and I'm unlikely to re-read it now, but that female perspective really influenced my thinking on the Arthurian legend. And The Bloggess is brilliant. Florinda - Mists of Avalon is probably the only version of the Arthurian legend I have fully enjoyed. I don't imagine I will re-read it, although I still have my copy. I used to own the Mists of Avalon, but I never read it...now I'm wondering if I still have it. I hope so. My dad was a Marine, life long in his heart till the day he died, altho he wasn't a career Marine, so I never moved around. I was born in Camp Pendleton tho. It's a very good list! And again...so many to put on my list!! Debbie - Same with my dad. He was a Marine through and through. :-) My dad was stationed at Camp Pendleton and I lived there for a couple of years. :-) It's changed so much since I was there. I was clueless about MZB until just now! Over the years I've tried twice to read Mists of Avalon and I loved it, but I'd get stalled because it is so damn long and then decide I need to start from the beginning next time. Who knows when that will be?! Fun list, I can't imagine moving so much as a kid. Stacy - I just learned about her past a couple or so years ago. It was very disappointing. It is a long book. I was clueless, too, about Bradley. Shocking, horrible stuff and I can't imagine how you would read her books now without thinking of what she is accused of doing. But that doesn't negate the impact the book had on you as a a reader and it should definitely be on your list. Lisa - I am not sure I could read any of her books now without thinking of it. So sad. What a fun list! I'm surprised there is no cat tale among your faves though .. there is a mouse, so that counts :) So nice to meet you! Aloi - It was fun putting together. :-) While I enjoy cat books now and then, none came to mind for this post. I would have had to include a dog one too. I was a dog person long before I came to love cats. :-) Thank you for visiting!